Whether you’re a Fortune 500 company or a brand new vision on the rise. You all share something in common and that is you understand the value that your staff, partners and team members bring to the table. While we can all agree that legendary customer service is essential to the success of a company, we cannot forget that satisfied and happy employees multiply your consumer base. Employees are your first customers! Keep them positive, motivated and inspired, and you as well as your clients will notice the difference between them simply showing up to work with you, or having them show up to work for you. When your team feels good about themselves they will in return cause your client base to experience consistent superb customer service everytime. Let us Inspire, Refocus and Motivate in either: a 40 minute Impact Session or a 1 hour Focus Session. 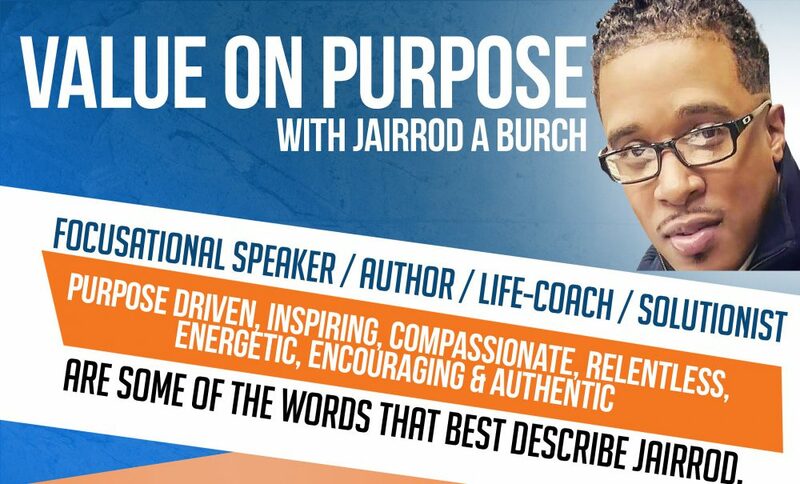 Jairrod will come in and speak bringing a fresh perspective on not just performing to get paid, but doing your best work because you know the value in personal commitment as well as assisting your team in reaching their collective goals. This investment into your staff, employees and team, lets them know that you care and are concerned not just about them at the workplace, but that you want them to succeed in their personal lives as well. Allow Value on Purpose to assist you in making your company stand out and, instead of just competing with others, excel in going that extra mile for your own.